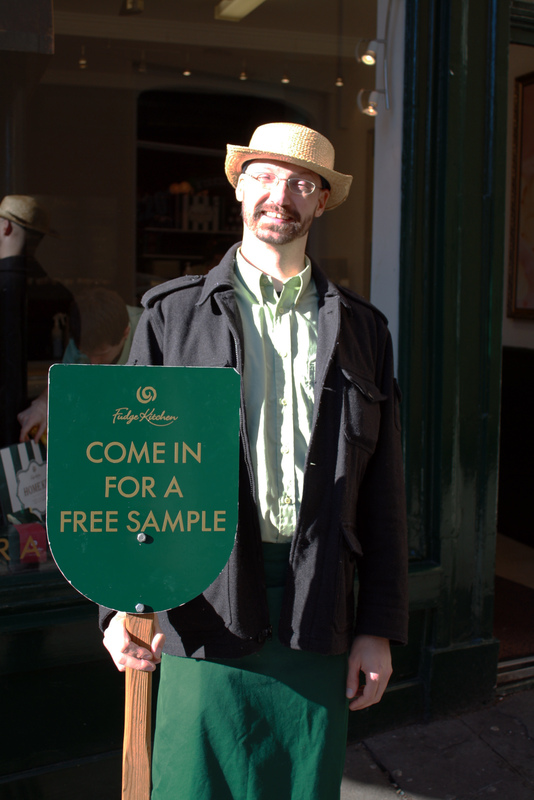 Come in for a free sample! Bath was wonderful in that much of the attributes of a historical city was intact. Something I look for in England is the England Enid Blyton describes in her books, but that is not that prevalent in what I have seen thus far – except of course I appreciate that Enid Blyton’s books are now close to if not more than fifty years old. Amie, who came with me to Bath is from Devon and according to her Devon is still very much Enid Blyton’s England. I can faintly recall Devon being mentioned in one of Enid Blyton’s books – first book of Famous Five perhaps. 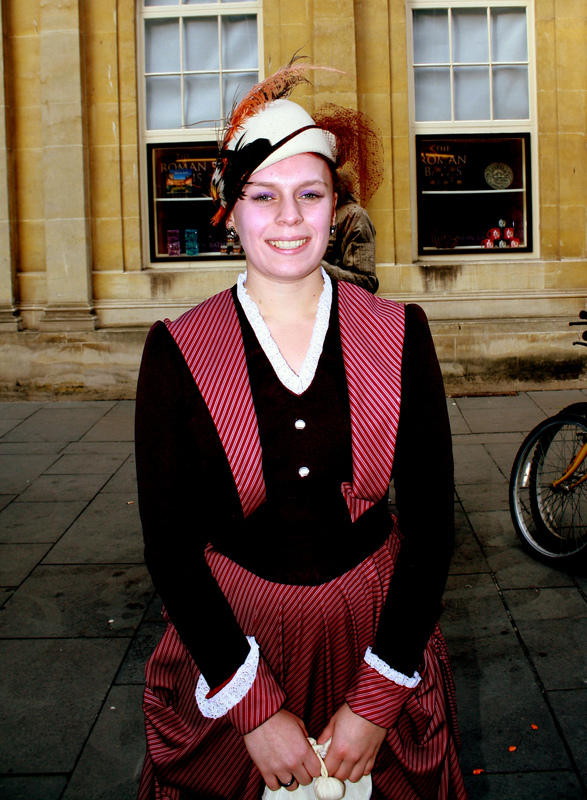 Bath had a very traditional fudge shop, where staff were clad in very tradition victorian attire and were inviting people to sample their traditional fudges. A ‘fudge’ in England, for those of you who have not tasted it is very much like the ‘Kiri Toffee’ in Sri Lanka, albeit a softer version that dissolves easily in the mouth but breaks into small pieces when bitten. I say this because someone may have stolen the name ‘fudge’ and totally misrepresenting it in Sri Lanka. Below are some of the portraits I took of the ‘fudge people’. Apologies that this one here is over exposed. And my favourite of the two. As photographs, not to the best of my liking. Just to document my travels. 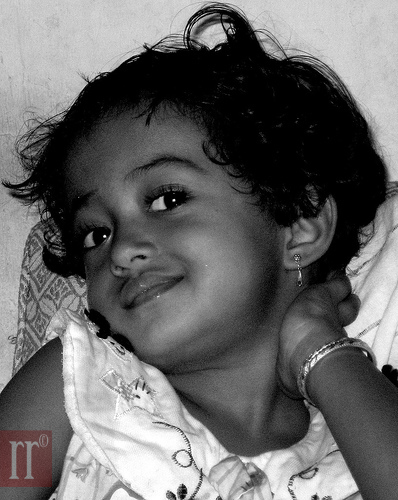 These are some of my favourite photographs that I’ve taken of little girls. This was taken when I accompanied my father in one of his site visits to Puttalam. 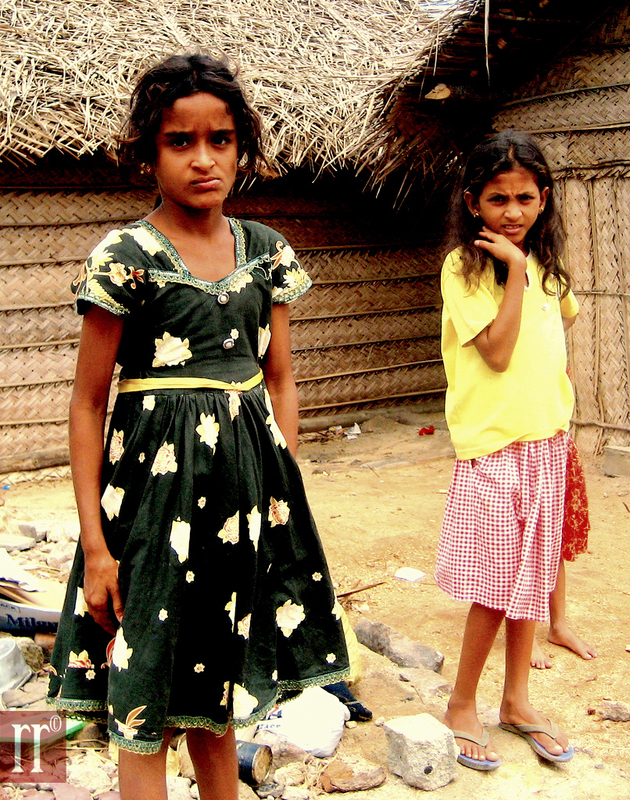 These girls may have been refugees or may have been not, but they surely must have something to do with the social dynamics associated with the refugee camps in Puttalam. 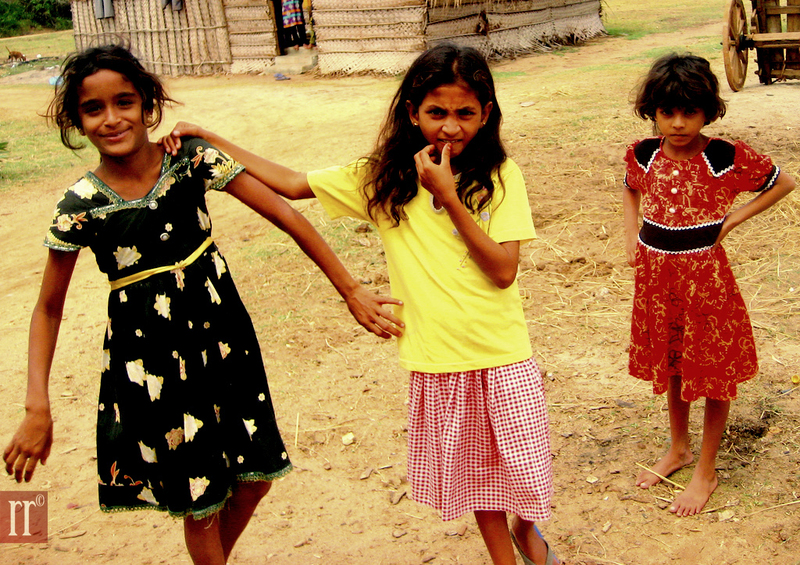 As is evident from the thatched houses in the background, these girls hail from a poor economic standard and clearly it was reason for them to be curious when some people ‘from Colombo’ came to the vicinity of their humble home in an SUV, something not often seen in the rugged terrains of some parts of the refugee camps . Their initial emotions were very much a blend of apprehension, curiosity or even a fear of some sort in seeing these foreigners, by foreigners I mean foreigners to their locality. Later on I managed to chat with them in Tamil, tried to make them comfortable speaking to me and distanced myself from any stereotype they may have had of me and then the floodgates opened! They were very extrovert once they knew I spoke their language and were indeed very playful. I like to think the image below reflects that, even though the sharp little one in red still seems to have some reservations about me. 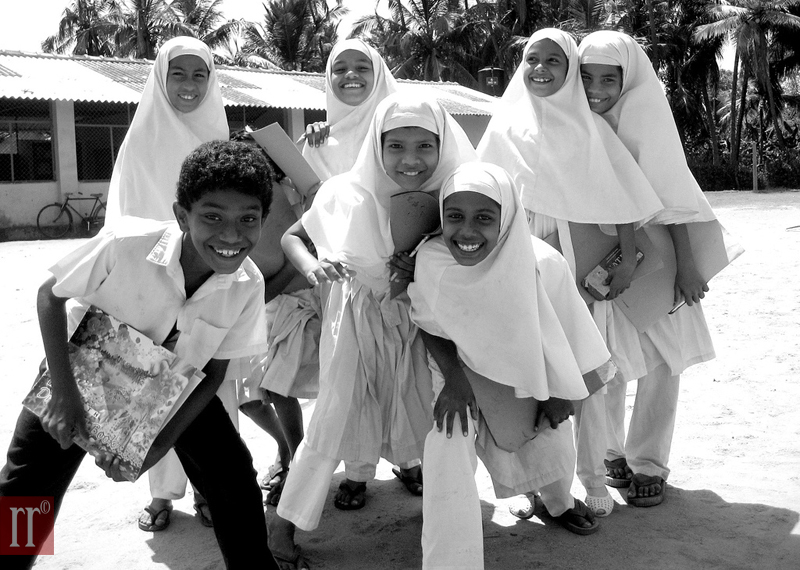 Of all the extra-curricular activities I have done, be it during school or afterwards in uni, one of the most endearing and satisfying experience I had was working on a children related Architecture project I worked for in Trincomalee. More about the project and more photographs can be seen here. 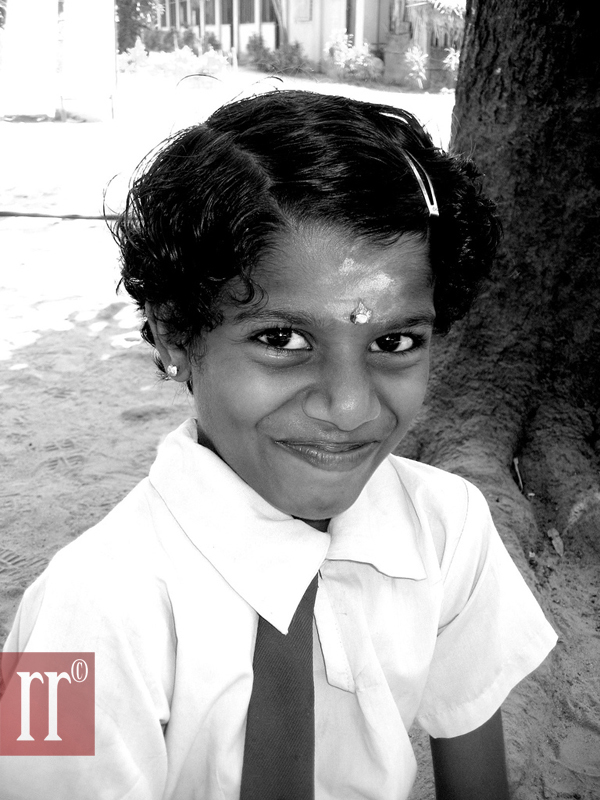 It’s amazing how photogenic children in their carefree ways can be, the most sincere emotions that children reflect from their smiles makes them such joyous subjects to capture. 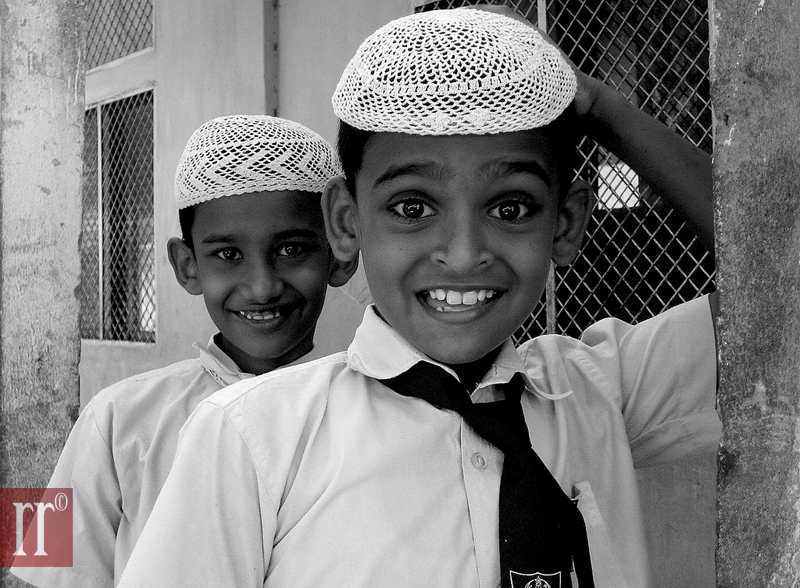 This is one of my favourite photographs I have captured of children. 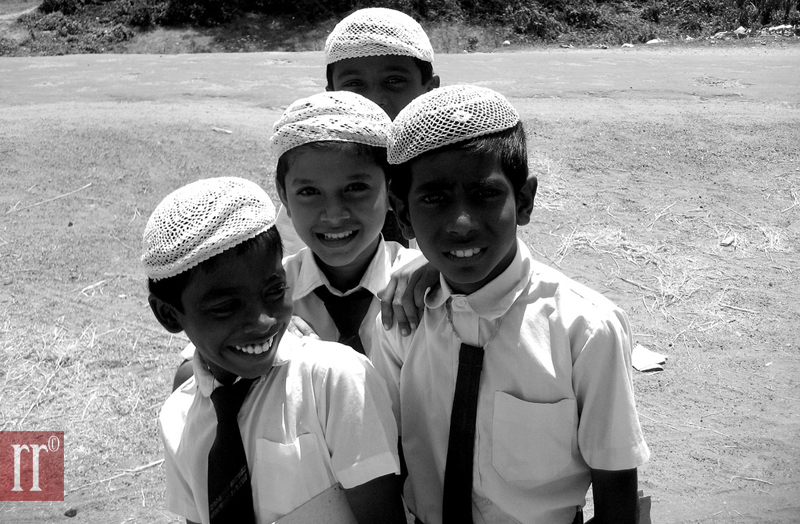 This was taken at a school in Muttur, Trincomalee, North-East of Sri Lanka. First published here on Groundviews. This war has taken the lives of tens of thousands of men, women and children. Hundreds of thousands more are displaced, and the abnormality of the war and post war situation is fast and painfully becoming normalcy to most people, some don’t and didn’t even live to see that. 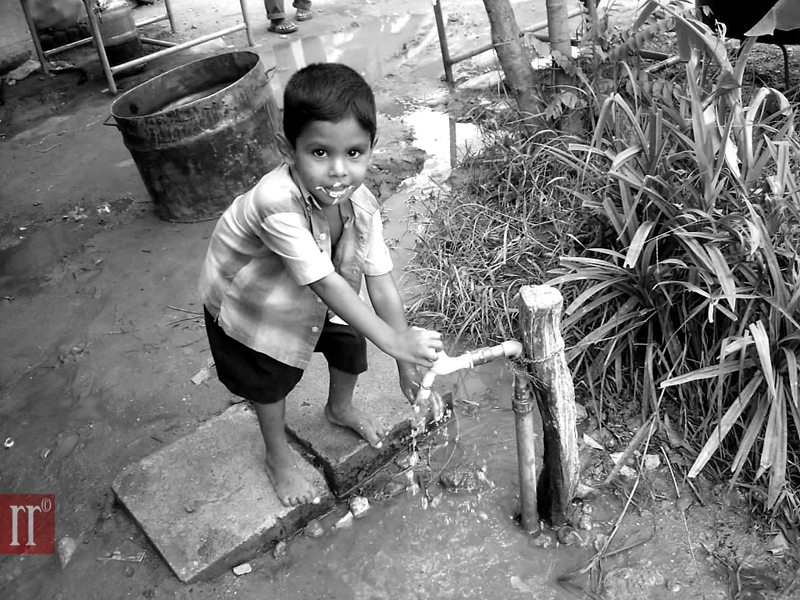 Hundreds of children are being born into such conditions, by virtue of the fact that the Muslim IDP’s displaced in the early part of the conflict are still languishing in Puttalam, I won’t be surprised if a decent amount of these children born would die (possibly as adults) in the same conditions to which they were born to. Studies suggest that post war trauma is conceivably more painful than the emotional stress suffered during war. During periods of war and despite the aggressive conditions that ensue, people subjected to these live in pain and indescribable stress. However, the hope that these abnormalities will diminish and normalcy would resume lingers on and this is a solace of sorts to those who look for solace in the most difficult of times. In a post war situation, when there is no conceivable military conflict taking place and the people continue to suffer in difficult conditions it is inevitable that post war trauma will tighten its venomous grip. Because of its brutality, this has become the paradigm for traumatic experience, with the constant need for psychological and psychiatric help for victims long after its end. 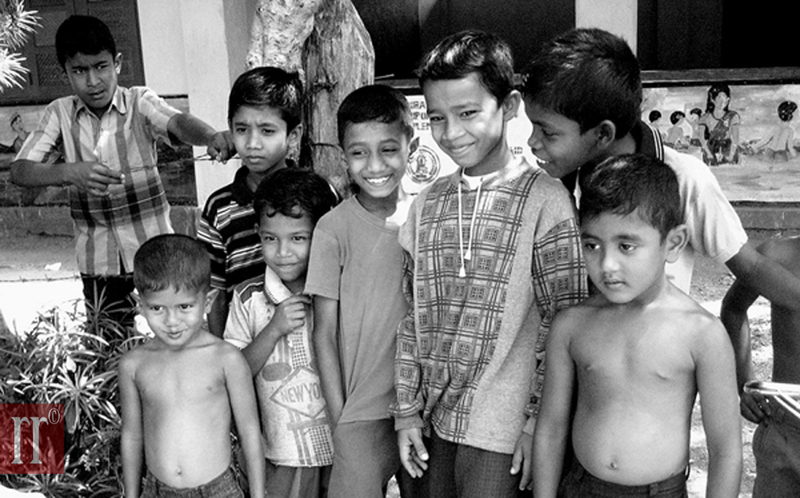 My father was the architect for a project called ‘Food for Education’ by an Italian NGO. 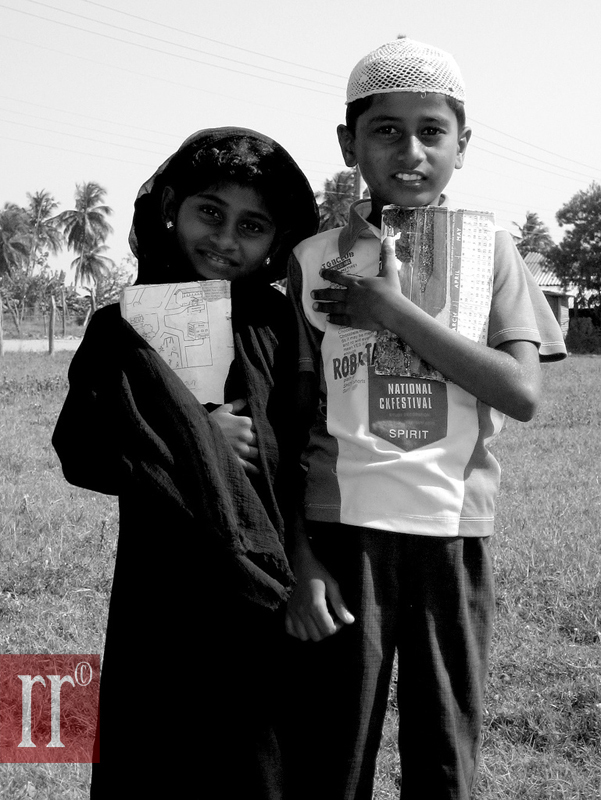 Thus he had to make several site visits to seventy schools in the Trincomalee District. 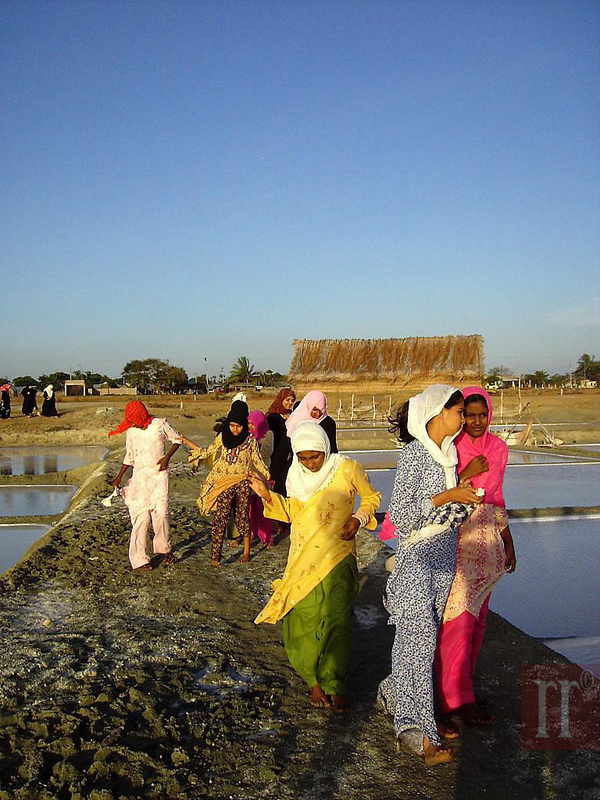 In addition to the war, Trincomalee was also severely affected by the tsunami of 2004. 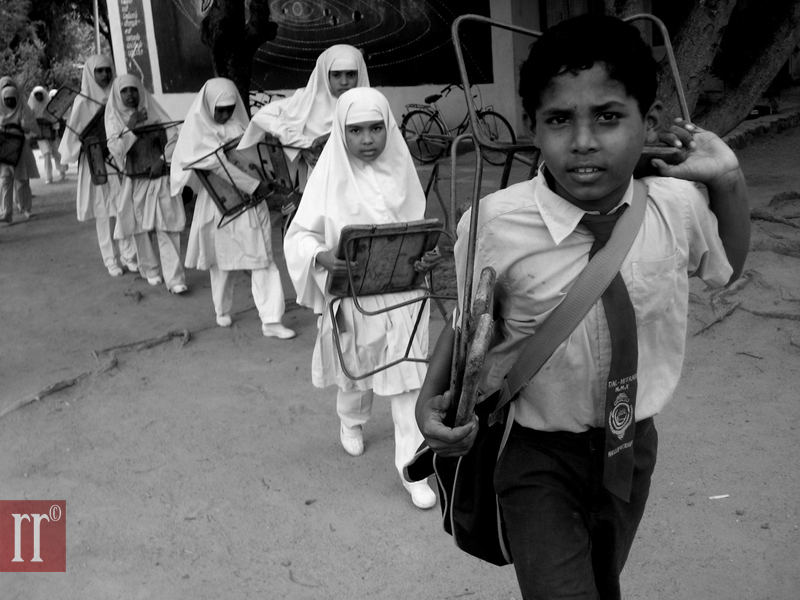 Due to poverty, lack of infrastructure, the loss of hope that school education will achieve little and for fears of safety, school attendance amongst children was very low. 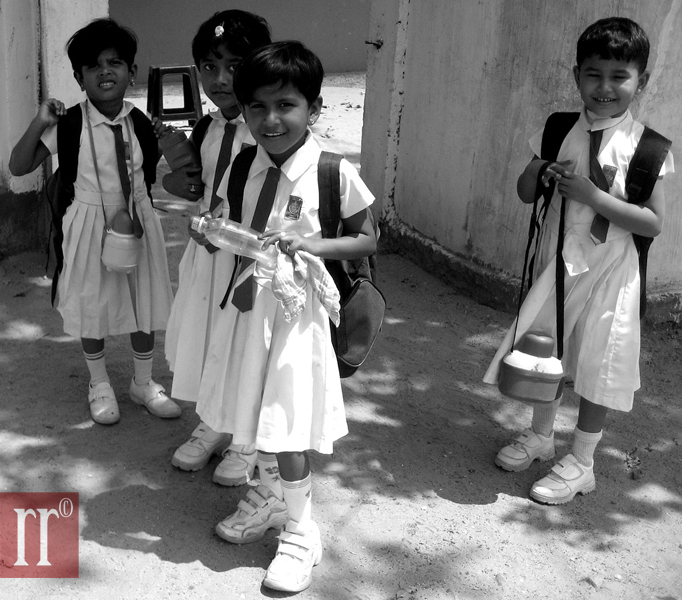 It was also known that malnutrition was rampant amongst these children. The project aimed to build Kitchen & Sanitation facilities in these schools and free food was distributed to students who attended school. 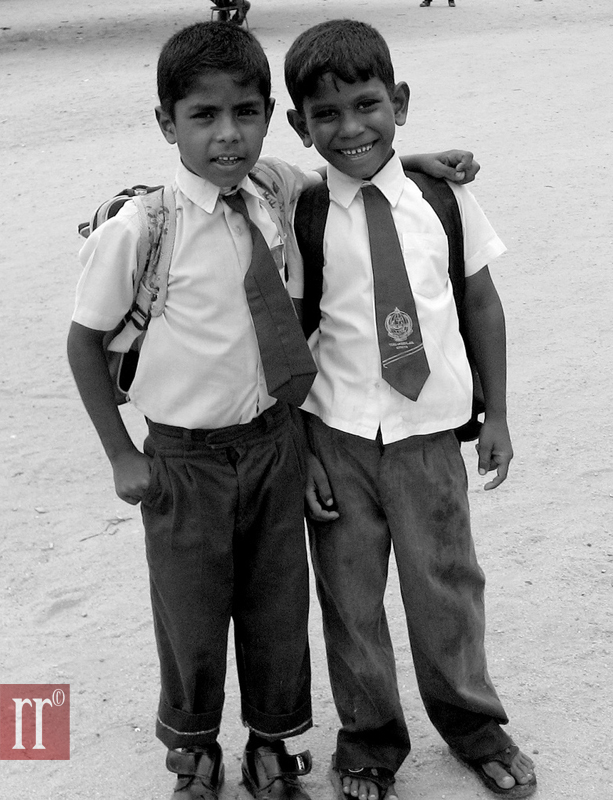 Thus this incentive helped mitigate absenteeism of school children to a certain extent in the Trincomalee district. 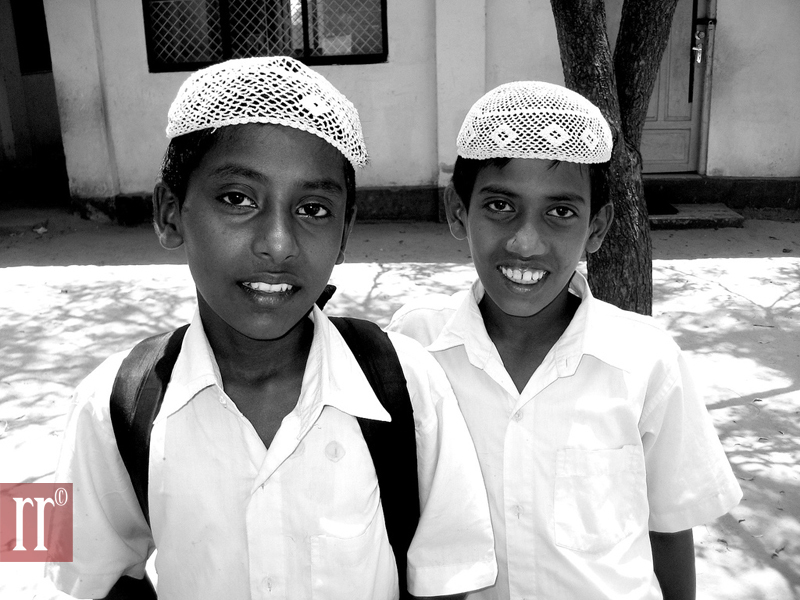 I joined my father in several of his site visits and I remember going to Trincomalee at least ten times during 2005 – 2006. 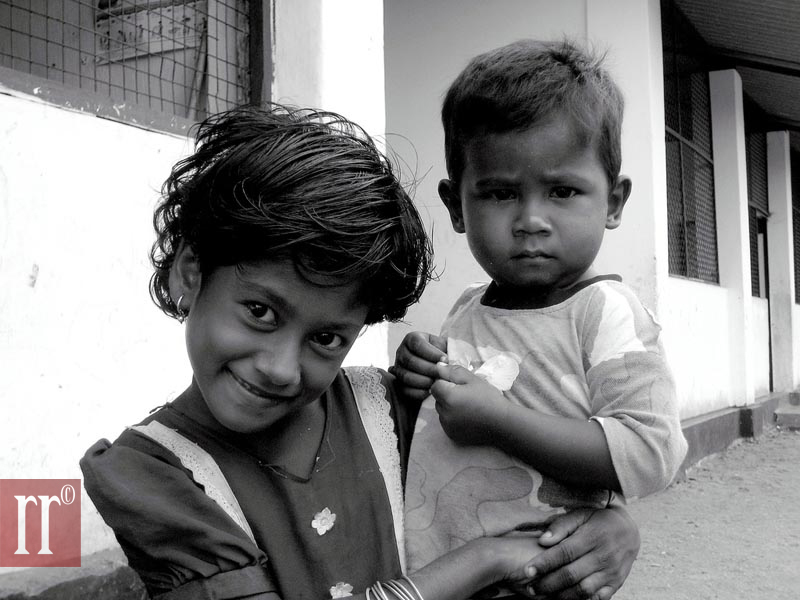 In spite of all the pain and suffering that was around, the faces of the children depicted a remarkable sense of resilience to the pain they and their families endured. 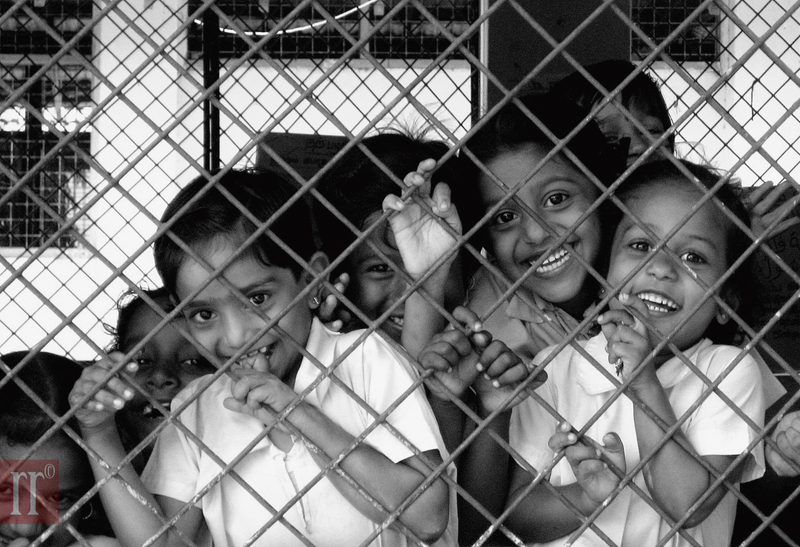 These children coupled with the ready and mischievous smiles in their faces disguised the very painful story many a parent I spoke to in my limited Tamil told me. There is now an end to a military conflict, and a year has gone by. And yet, there is years of work to be done in these areas to rebuild shattered hopes, dreams and society in general. 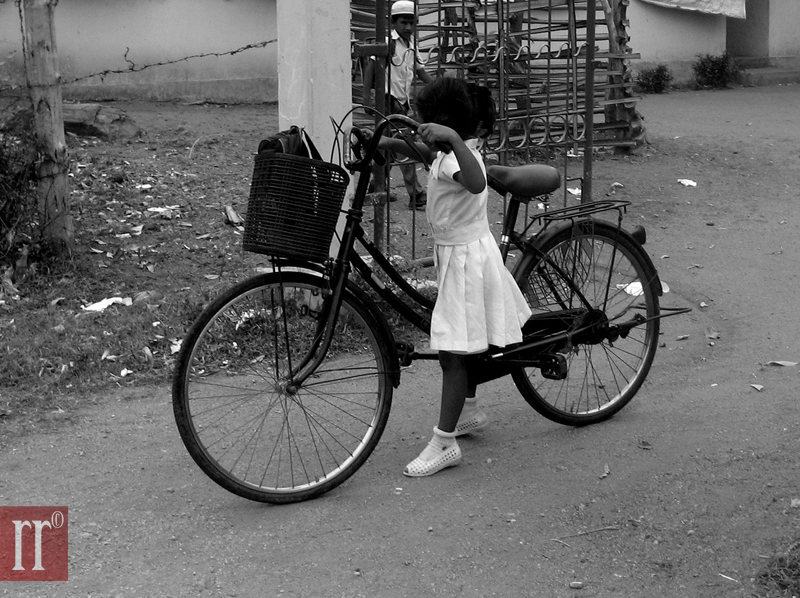 These photographs can only attempt to ask questions about and to do justice to the untold story of many a child. 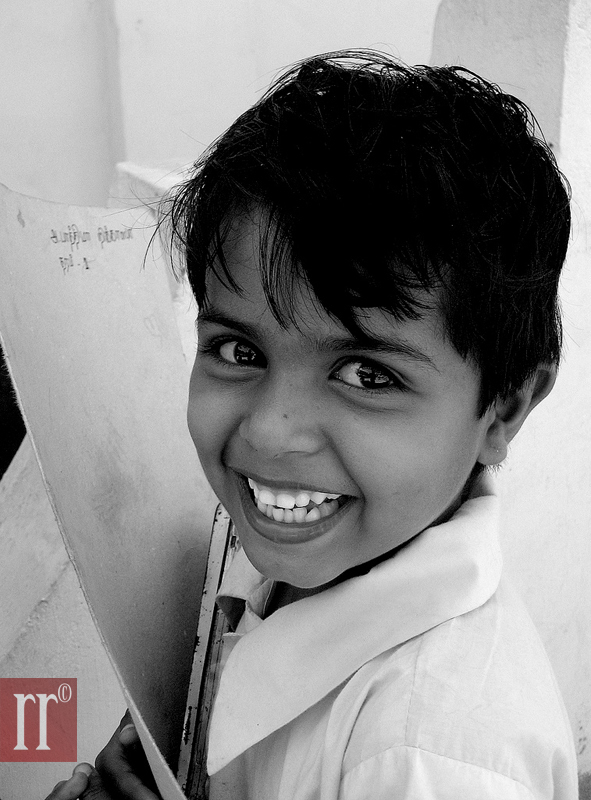 If not of most, this conflict didn’t manage to wipe out the smiles of all children in conflict zones. We must ensure that they never are, at least by planned yet hastened resettlement of all affected men, women and children. My cousin as a three or four year old. Quite the drama queen, just like her mother. Those who have been on Kottu long enough to remember the first would see the title and smirk, “ha ha blogstitute” with fingers wagging in proportion to their stretched out tongue. Well, this is an exposure of a different kind. This blog is only about photographs, and photographs only that which I had taken and with my camera, and any accompanying text usually is a piece of gibberish that compliments the photograph. But for the first time in the several year history of this photoblog, it will host a blog post sans a photograph taken by myself. I have met several Sri Lankans through online social networking sites (other than facebook of course), the first was Chamina who I met on flickr, and to this date she is a very good friend of mine and we don’t miss the opportunity to meet for a bite somewhere in London over a productive session mostly consisting of juicy Sri Lankan political gossip on a whole plethora of different dimensions, and just life in general. Relatively recently I got to meet pseudorandom, again a very nice person I am truly glad to have met albeit a bit too much of a fan of Cheryl Cole, particularly if she was wearing something purple . I have a lot of people who were friends first before they became bloggers, but clearly there is a difference between meeting new people who become good friends via blogging, and getting to know that an old friend is a blogger. The rest of the bunch I got to know via twitter, but sadly I have not got an opportunity to go to Sri Lanka since twitter got ever so rampant about mid last year to meet these ‘tweeps’ in person, though I do have a vague idea how these people look like. Inshaallah I will be coming home before this September and meeting some of these people is definitely on my to do list. This other person I had the utmost pleasure of meeting is Rhythmic Diaspora, of course there is a lot of vociferous intellectual jargon hovering about the air suggesting that in fact he should be called ‘Rhythmic Transnational’, on a purely scholarly sense it may be correct to call him Rhythmic Transnational – but who cares, Diaspora is what we are used to in day to day conversations and besides, if that was to happen he will share the same acronym used for Rotten Tomatoes, now we all don’t want that do we ? So Diaspora it is. As RD has already said here, I went to this film screening he invited me to. I had seen the film before, so quite sincerely I went to meet the great Diaspora himself since many of my friends have spoken highly of him. He was on my facebook at the time, but for a young architect – my rather photographic memory failed me when it came to remembering how he looked like, as if to suggest that RD is some elevated person who when poked in the shoulder your finger will meet icy cold air. So rather pensively I walked in, followed by as RD has described them my couple of glamorous groupies. To my surprise, there were a lot of people of all hues and saturations, and this resulted in my mind becoming rather benumbed, with the groupies monitoring my every step like vultures gazing at a fat carcass I had to act swiftly, and to make it worse no one was wearing name tags. And then, after a few seconds that felt like eternity, the wheels began to spin, just as it would to anyone subjected to such scrutinous pressure. With a slight sense of apprehension albeit with conviction, I began to look for someone wearing a ‘Superdry’ label and the groupies nodded in familiar awe, not because they knew what I was doing but clearly they knew I was up to something. And Lo and Behold! There was RD dressed in smart casuals with the unmistakable and now talismanic superdry label adorning his shirt. Thus began the first of our many encounters. I have met him twice after that and I must confess, devoid of any semblance of sarcasm that it is genuinely a pleasure to have met RD. I don’t mean to hack what many people who have met him already know, or reinforce what people who speak like they have met him already endorse – but RD is an absolutely nice person to spend some time with. Given the fact that I am much younger than the still young RD (no..really), I feel that I am under no pressure to make an unconscious effort to assert myself, like one may generally tend to do when in the company of peers – but rather I can chill out and just be a ‘podiyen’ and bask in the atmosphere knowing there is someone with greater experience and maturity to handle things. I am honestly thrilled that I got to meet someone of the calibre of RD, someone who understands things in depth and someone who would rightly know the most appropriate way to handle things. For a drummer, he is incredibly soft spoken and is polite to the most meticulous nuance of his voice. There is a sense of comfort and nonchalence when he speaks, and I hope I have enough liberty to say that having met him just so many times I am not in unease in conversing with him. Enough sugar there to make a diabetic whince, eh? With due respect to the fact that RD has been blogging for a couple of years more than I have and anything of the ‘pants wearing side’ has never surfaced, I am certain that not many people will be able to expose any juicy gossip, except perhaps C if she reads this post. 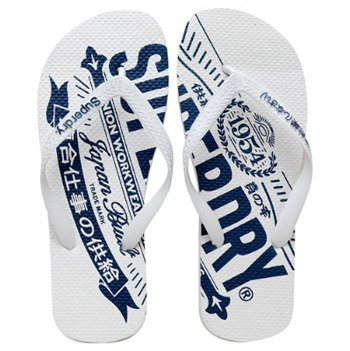 So until then, everything‘s superdry! Two images I took when I was at home. The one on top was taken when I was staying at the Polonnaruwa Rest house, a beautiful building cantilevered onto the lake, I am told it was hastily built as a place where Queen Elizabeth II can stay when she visited Sri Lanka I think in 1952. I was staying there with some friends and they all left me after a few days as I had to stay an extra day to finish some commitments, naturally I was feeling a bit lonely after having spent so long in the company of my friends. Then all my phone could do was make calls and recieve them and send and recieve texts, facebook was relatively new and twitter was unheard of. 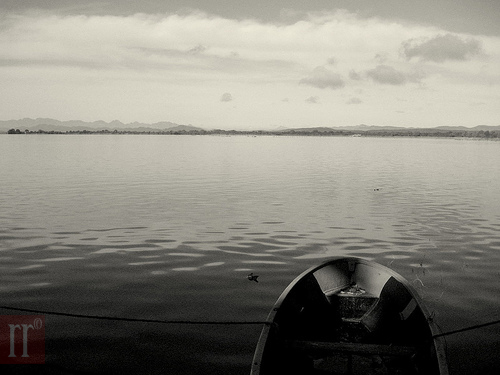 If I recall right, this was taken in 2007, and justifiably insinuates my frame of mind at that moment in time. 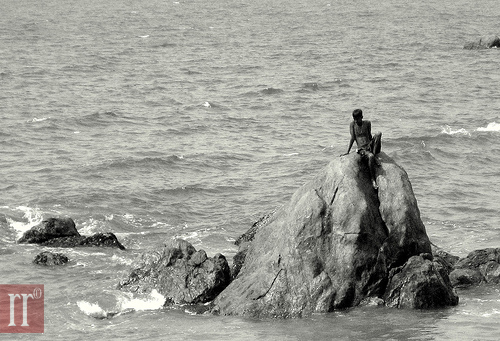 The second picture was taken from the terrace of the Mt Lavinia hotel, obviously this guy doesnt feel lonely, his friends were swimming around him as if he was seeking refuge on top of that rock from a bunch of Piranhas, albeit the picture suggests otherwise. Somehow, the second picture reminds me of this incident and hence I don’t really appreciate the stories that flood my mind when I see it. I must confess the timing of this shot was very accidental, nevertheless its interesting that I managed to capture the man jetting out a spurt of water from his mouth! He possibly is a Mahout after a wash of himself and the great mammal beside him. I can’t recall if I have posted this picture before. 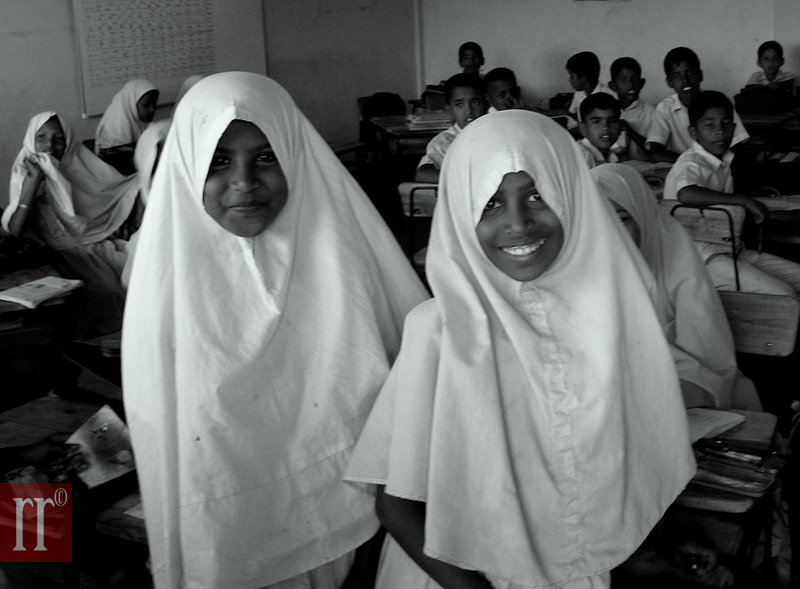 This is a picture I took of some village girls in a saltern in Puttalam, Sri Lanka. Possibly because of the vivid colours and natural expressions this is a personal favourite of mine, and only reminds me of how much I miss home, and how I long to take more photographs in Sri Lanka. Tableaux of Aufidius by On Architecture,Landscapes,Nature and Emotions.. is licensed under a Creative Commons Attribution-NonCommercial-NoDerivs 3.0 Unported License. Based on a work at taufidius.wordpress.com. Permissions beyond the scope of this license may be available at https://taufidius.wordpress.com/.